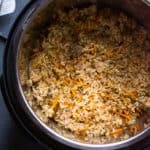 OMG this ah-mazing Instant Pot chicken and rice is in our regular dinner rotation and everyone who tried it from me, asked for the recipe. Even non-brown rice eaters like my new neighbours – we ate it on the beach in September! With boneless chicken breast or thighs and rice all ingredients cook in one pot without hovering over them on the stove. If you are from former USSR you know how time consuming “plov” is. 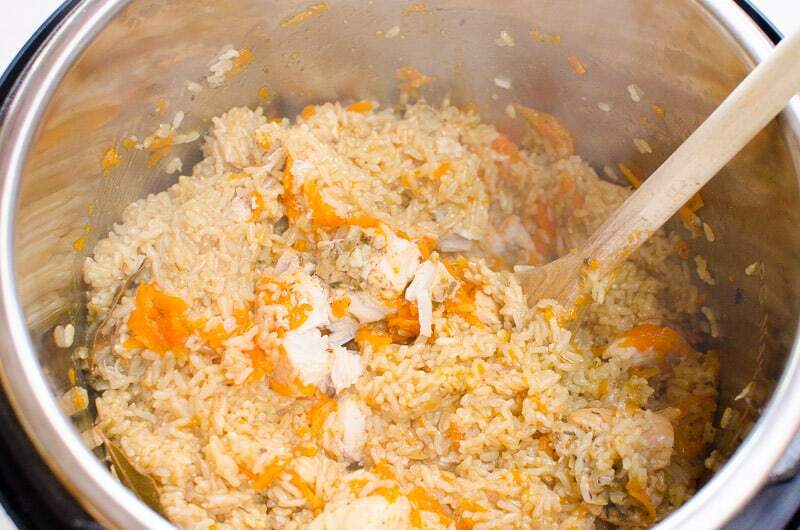 Slavic countries are known for their outstanding plov (pilaf) dish and this is how we made ours in Ukraine. Only we had to hover over it on a stove for more than an hour. 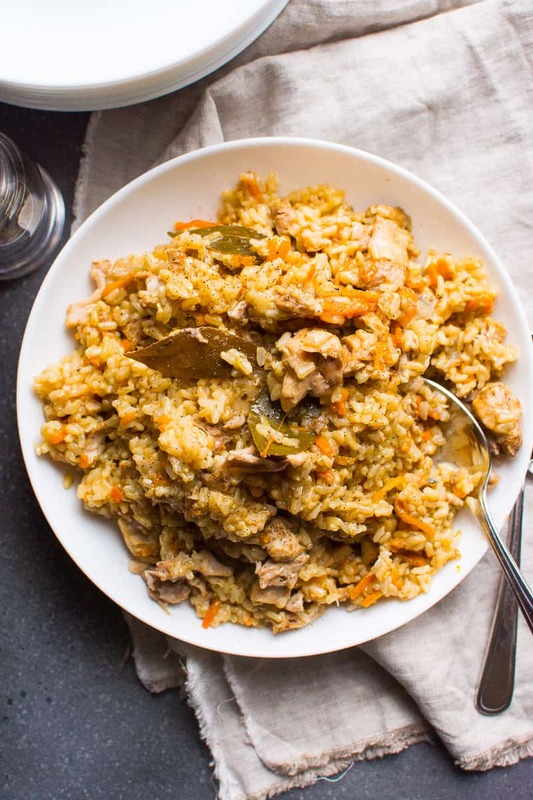 When it comes to chicken and rice in Instant Pot – everything cooks in one pot! So, my version of my childhood rice pilaf turned out perfect and not mushy at all. Don’t you even think about cutting down the recipe. What Does This It Taste Like? 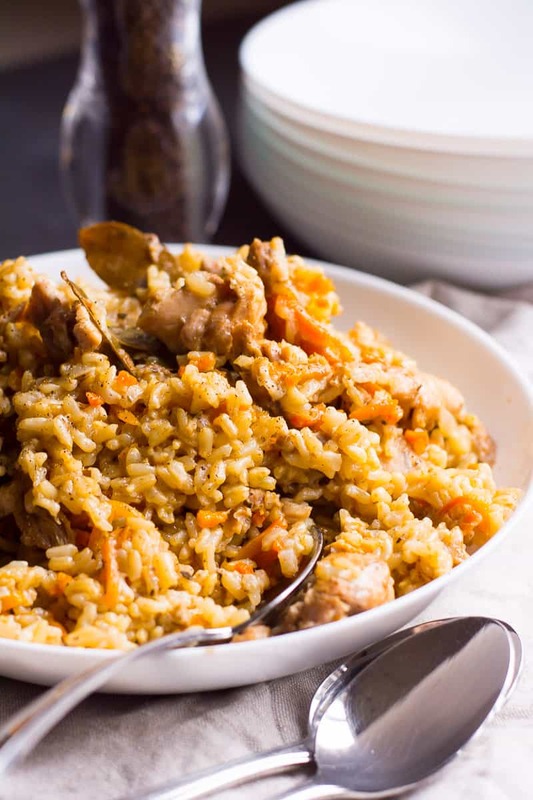 Pilaf or “plov” is a national dish in a republic of former USSR, Uzbekistan. Because Russia, Ukraine and Belorussia etc. were part of USSR as well, each country has its own variation of chicken and rice. I don’t claim it to be original but it’s a delicious variation. Spices usually used in chicken and rice are garlic, cumin, dried thyme and oregano, salt and pepper. Uzbeks add native to their land spice. But Ukrainians and Russians keep it simple. 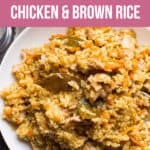 This recipe is NOT a healthy version of chicken and rice casserole that Betty Crocker invented with a can of mushroom soup. This is a simple dish of meat and rice with their own complex flavors. I am from Europe and our food is fresh and simple. We do not cook with even 5 spices at a time. We rely on salt + pepper and fresh herbs at the end. 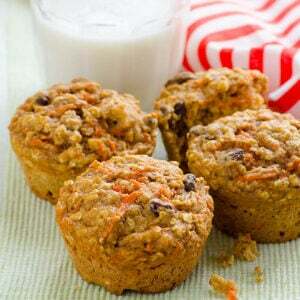 And to enjoy the flavors of main ingredients. So, if you expect a punch of spiciness or something else whatever means “not bland” (honestly I’m not sure what would be expectations of some for chicken and rice), feel free to add hot sauce or maybe my simple recipe is not for your taste buds. Just saying to avoid lashing onto me after your long day. :) I honestly don’t understand how brown rice + chicken + salt and pepper can be “bland”. Even without any spices this combo tastes amazing to my entire family. OK? Great! 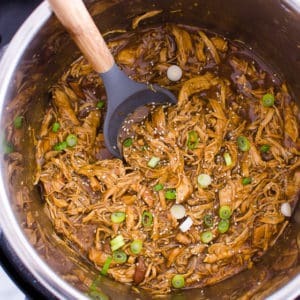 My pressure cooker chicken and rice recipe is simple. Spices: cumin, dried thyme and oregano, salt and pepper. Unfortunately the answer is “No” because it has different cooking time and requires different amount of liquid than brown rice. 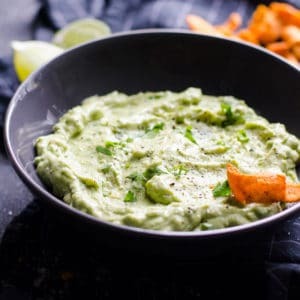 I completely understand many folks prefer white rice to brown rice, and I’m probably the first recipe offender – I always try to use what I have on hand. But please follow this recipe for best results and use brown rice. Maybe I can convince you why you should try this chicken and rice with brown rice. Unlike white rice, brown rice contains the bran, germ and endosperm which all offer nutrition. White rice is completely stripped off of these nutrients. 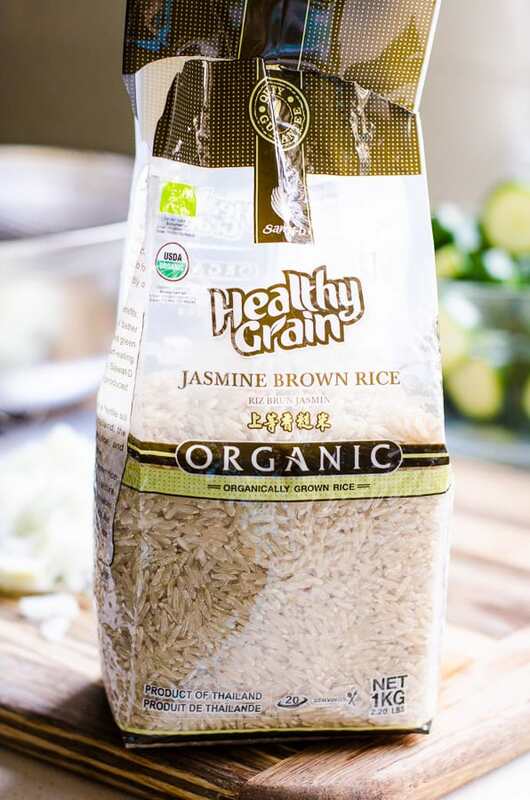 Relatively low in calories for a carb (216 calories per cup), high in fiber and gluten free, brown rice is at the top of complex carbohydrates list. High in B vitamin, folic acid, iron and minerals. 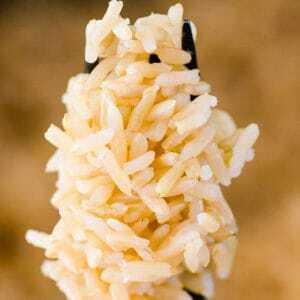 Yes, it is true that rice is high in arsenic, especially brown rice because it absorbs large amount of water while growing. However, FDA analyzed over 1,000 samples and indicated its levels are too low to cause any immediate or adverse health effects. 4. What Kinds of Rice Are Good for This Recipe? I rinse rice for 2 reasons. 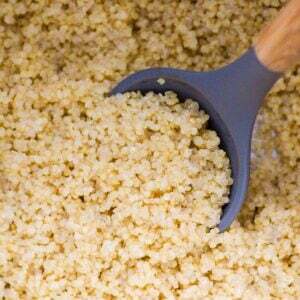 To remove extra starch so each grain comes out more separate rather than mushy. Almost perfectly cooked rice. And to clean. That rice has been processed by who know who and in bags for who knows how long. The answer is “Yes”. However, there are a few notes to take. Pieces have to be separated otherwise “the blob” of frozen chunks of meat will not cook through inside. I would say this scenario is good for when your meat is half thawed (you forgot to take it out well in advance) and you are able to cut it (I even use kitchen scissors to save on washing the board). Pressure cooker chicken breast comes out perfectly juicy! Instant Pot chicken thighs being the next best thing. 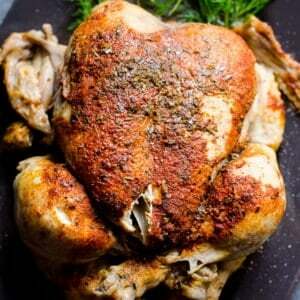 If using whole breasts or thighs, make sure they are separated. 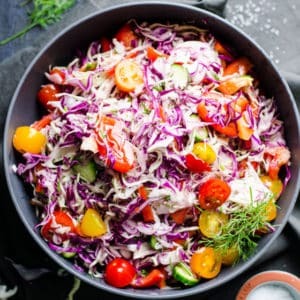 After dish is cooked, carefully remove whole pieces of meat, shred or cube on a cutting board and return shredded chicken back to the pot for gentle stirring. You don’t want to make chicken and rice more mushy. If using frozen meat, pressure cooker will take longer to come to pressure because the appliance has to heat up all ingredients inside to a certain temperature to build up the pressure. 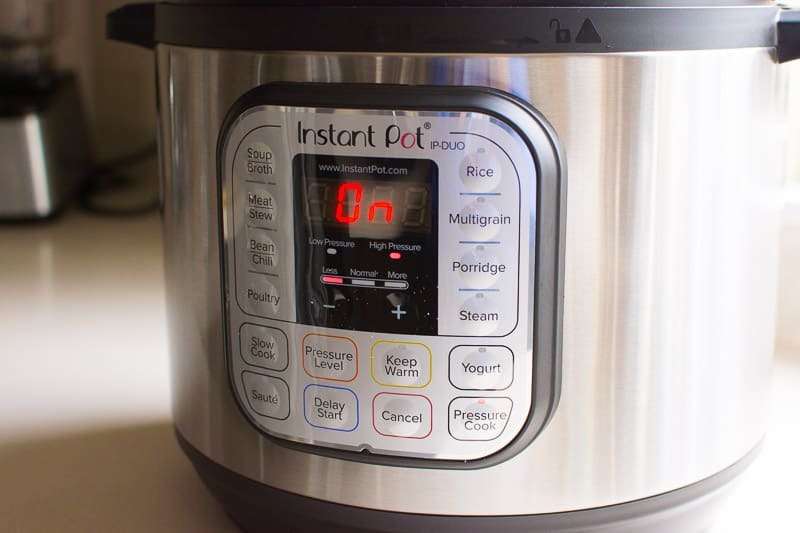 Why Cook in Instant Pot? 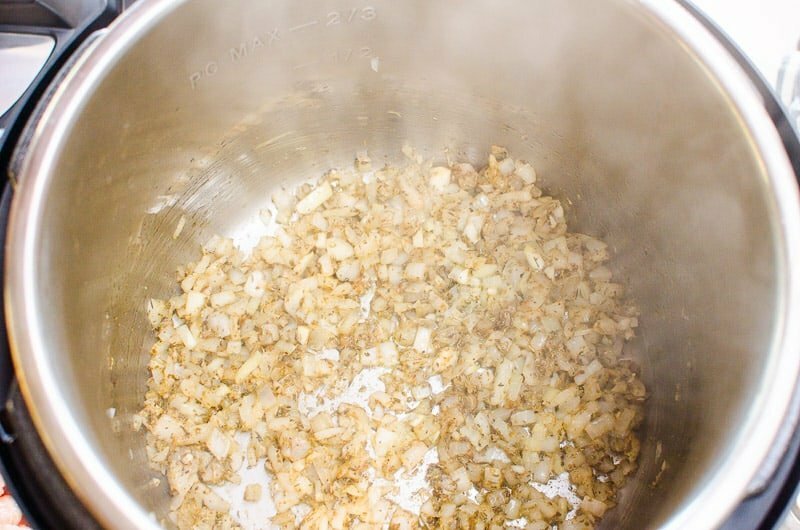 If you ever cooked pilaf or “plov” or chicken and rice on the stove, you know how time consuming is the process – you have to bring to a boil, stir, cover, wait etc. With pressure cooker, it’s truly hands off method and I swear chicken and rice comes out just as good! 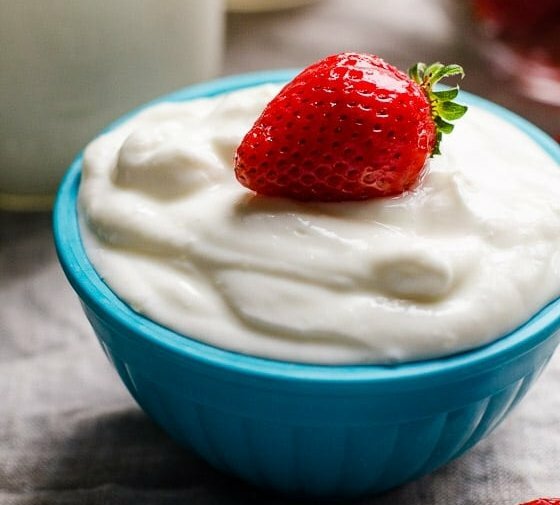 Can I Make It in a Slow Cooker? No. In my experience any rice in cooked in a slow cooker becomes a complete mush. Tip: Cooking dried herbs helps them release their maximum flavour unlike if you add them straight to the pot. It is important to add remaining ingredients in the following order: chicken, carrots, rice, water, salt, pepper and bay leaves. 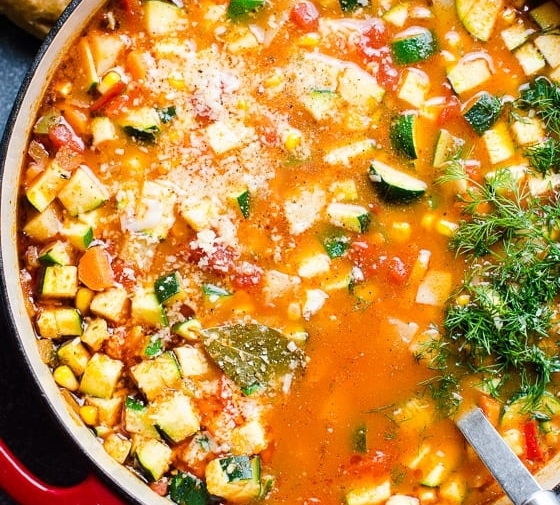 Because with hot plate heating up at the bottom of the pot, certain ingredients tend to burn. With Instant Pot, rule of thumb is meat at the bottom, then other solid ingredients and cups of water (broth), and anything tomato on top, if using of course. It is contrary to what you see me do in the video, I know. I became more experienced with Instant Pot and I found that it is not necessary to stir chicken and rice. What if I stirred by accident? It’s OK, just let it be. It will come out fine. You can but I do not see a need to spend extra money. Chicken cooked with water turns liquid into broth. Close the lid, set pressure vent to Sealing and press Pressure Cooking on High for 22 minutes. DO NOTHING after that! 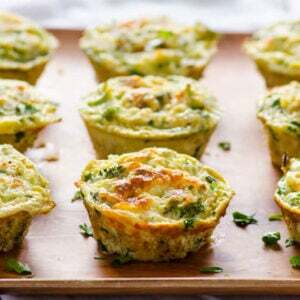 Instant Pot will do its job – display will say ON, appliance will take time to heat up, and then cook for 22 minutes. When display says OFF, release the pressure using Quick Release method by turning pressure valve to Venting position, which takes 2-3 minutes. I found that with natural release rice comes out not as crunchy, each grain not as separate and a bit more mushy. Not by much, just a tad. We like it any way and I use both methods depending on how the day unfolds. Why do you take your Instant Pot outside? Exactly to release the pressure to avoid the house smell like chicken and rice for a day. And frankly, splatters from the release valve make a mess on the counter is and mess in the house. It’s my personal preference and you don’t have to. Once you open the lid, that’s what you should see – leveled chicken and rice where rice has absorbed all liquids and each grain is separate. What If Rice Came Out Mushy or Crunchy? 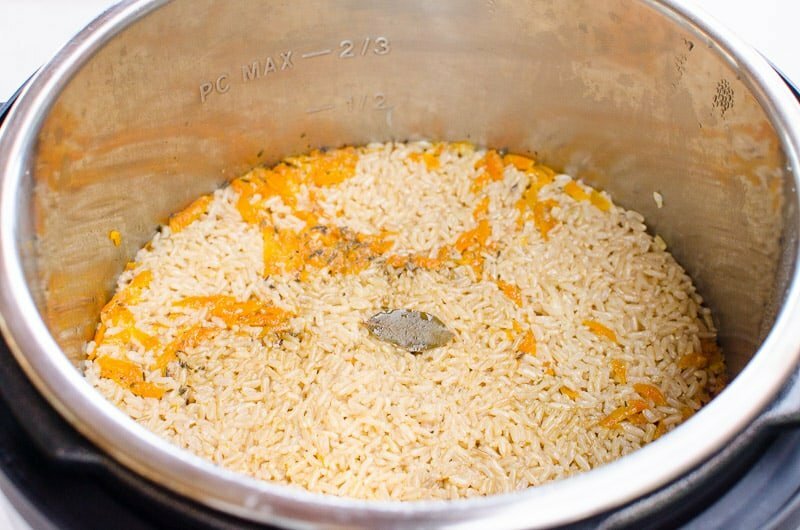 When it comes to rice cooked in a pressure cooker, it’s a little bit of trial and error method for everyone. Sometimes different varieties of brown rice cook differently. Also rice could be old. I always use long grain brown rice and buy one brand. Last time my husband bought different brand and it needed maybe 1 more minute cooking. Once you find “your rice” you will know how long it cooks and you can add extra minutes. 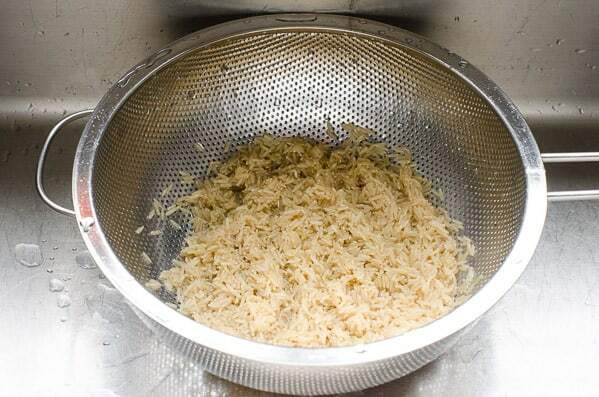 If your rice comes out crunchy: stir, close the lid and let it sit for 20 minutes. It will get there. Also try to add a few more minutes to cooking time next time. Unfortunately, you can’t re-close the lid, cook for extra 2 minutes and say that’ your new cooking time. You have to try recipe from scratch again to find your rice cooking time. If your rice comes out mushy: cook a few minutes less next time. Easy-peasy. Stirring vigorously will make rice more mushy. As you stir, discard bay leaves. I know some like peas and corn in chicken and rice. Add them frozen and stir gently one more time. I understand some of you do not feed a small army like me. 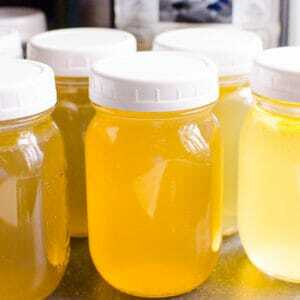 Yes, you can freeze leftovers in an airtight container for up to 3 months. Or scoop out some of the rice and use in other dishes. 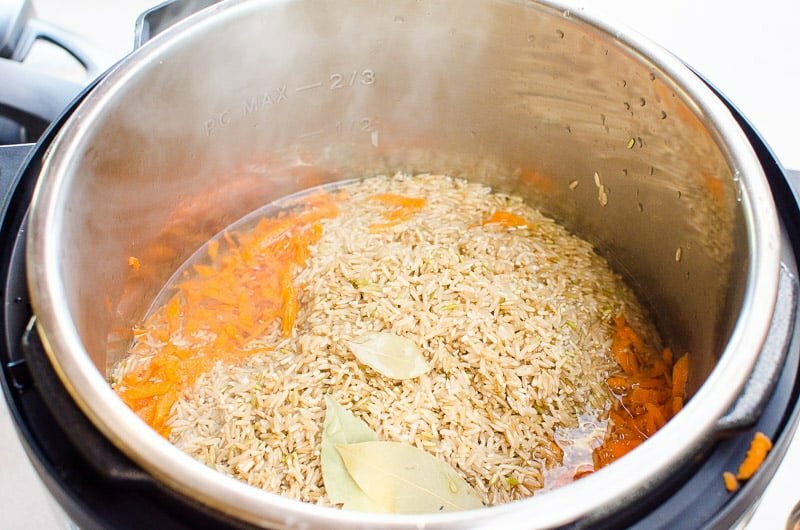 Please do not change anything in recipe as Instant Pot ratios of water, rice and other ingredients have been calculated for optimal result. 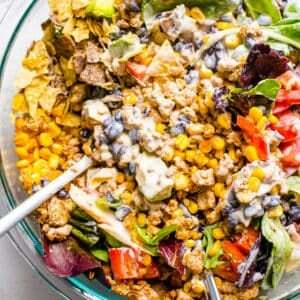 Healthy chicken and rice casserole – Betty Crocker’s classic got a makeover. 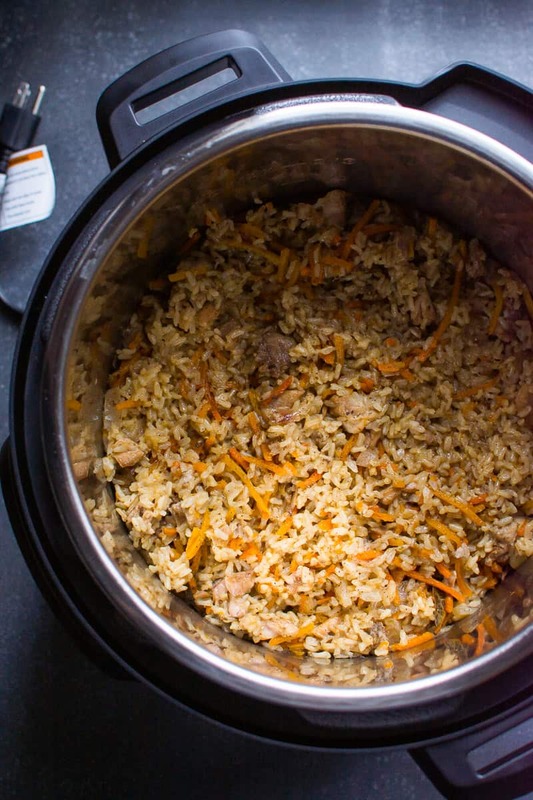 Instant Pot fried rice – everything cooks in one pot, even the eggs. Healthy chicken wild rice soup – creamy classic without the cream. Instant Pot chicken noodle soup – even pasta cooks in one pot! 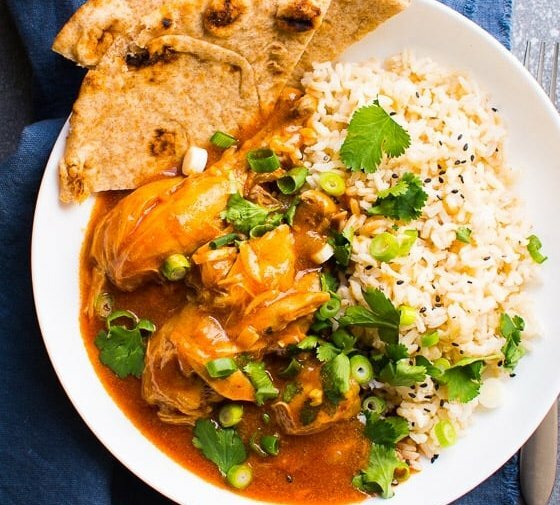 Instant Pot butter chicken – one of my favourite pressure cooker chicken recipes EVER. Instant Pot chicken breast – perfectly juicy and shreddable chicken breast in 20 minutes. Instant Pot frozen chicken – whole roasted chicken in under 45 minutes from frozen.